The charity's vision is of a society where trusted companies offer great products to financially educated consumers. This will make life easier and happier for everyone. 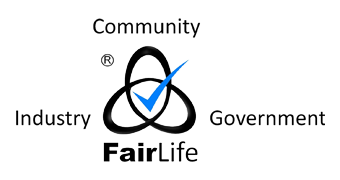 The FairLife Charity offers a route to this vision which works for the community, industry and the government. The finance industry, assisted by the FairLife Mark, offers products that are fairly traded and honestly priced. The Government contributes and ensures these products are fit-for-purpose. And finally the people step forward and choose these products, sending a clear message that they want change. Money from the FairLife Mark is used to promote financial education. This creates a virtuous circle as financially educated people are more likely to buy FairLife products. It works for everyone. A trusted finance industry will enjoy stronger revenue growth. A more educated population will be better employees and less burden on the state. And a World of honesty and integrity will allow people to enjoy their lives and plan their futures with confidence. The FairLife Charity will free people to tackle today's problems with energy, knowledge and confidence: energy to work hard; knowledge to make the right choices; and confidence that you'll get what you’ve paid for. Your business, staff and customers will all benefit from fairer banking. It will save money, time and stress helping everyone to be more focused at work. The FairLife Mark also sends a message to your staff and customers that the company has their best interests at heart. The FairLife Charity wants a finance industry that is bigger, more profitable and more trusted. Most firms recognize that they will be more profitable offering products that people trust and are keen to have.